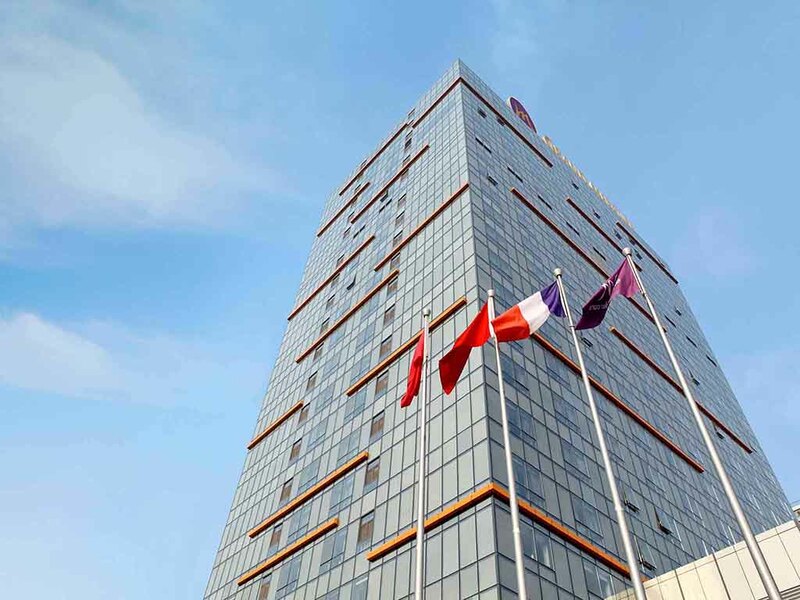 Located in the western commercial centre with easy access to high speed West Railway Station and only 15 minutes away from Spring Square, the 333 room Mercure Jinan Sunshine overlooks the nearby mountains. Complete with supporting facilities, Grand Mercur e Jinan Sunshine is the perfect choice for both business and leisure travellers. Cantonese specialities enhanced with local favorites dishes. Oasis provides All-Day dining with International and Asian specialities available via a la carte and buffet. Vue is the lobby bar to meet friends and business contacts, while enjoying your favorite beverage. In general it was good, breakfast asl well worth of money. Regret rooms are worn out and needs to be refurbished. Take care about water supply and plumbing equipment - they are simply in bad condition. Good hotel, bad HVAC system, poor room quality finish. I like the hotel, the staff, the breakfast buffet. But the heating in the rooms is an issue, I made multiple complaints about it and my problem was never solved: it was always too hot in the room, around 25C which is way too much. I know it is the winter and its ''out of your control'', but the heating system should be able to let guests control their room temperature. Also, VERY POOR WIFI. I am satisfied for you hotel. This year, the facility such as towel is worn-out, others are all very good. Live several times accorhotels but this is my first time as the member. And first understand so many brands in the Accorhotel group. The Jinan hotel is good but the reception only have one person so the guest need to wait so long time. Check-in was very efficient. All Platinum Le Club benefits were provided without prompt (room upgrade, drink vouchers, welcome gift), which is fantastic. Too many Accor hotels require you to ask and beg for these basic things. I believe the Executive Lounge is closed, as the Happy Hour is held in the bar and restaurant on the ground floor. We were originally allocated to a Junior Suite on the 21st floor (room 211x) - I can't remember the exact room number. We had been allocated this same room on a previous stay, and the shower door was slightly broken, which resulted in water going everywhere during a shower. When we arrived for this stay, we checked the shower door immediately upon arriving, noticed it was still not fixed and asked for a different room, which was granted. We appreciate the hotel promptly arranging a new room for us, though it is a little concerning this shower door was still not fixed in the two weeks since our last stay. Hopefully it has been fixed now. The room we were moved to was, I believe, an Executive Suite. The room and bed is extremely comfortable, and quite clean. The shower has a very weird and strong 'drain smell' following use. This has happened in all of the times we have stayed. Having TVs with accessible USB ports is fantastic, as we can watch our own movies, though in the Executive Suite they are a little harder to access, as the TV is in a &quot;cubby&quot;. The working desk is large enough for two people and the hotel was kind to provide us with a second chair to use at the desk. The Executive Suite has two bathrooms, one is smaller with just a toilet and sink. However, despite us using both bathrooms for our entire stay, each time Housekeeping refreshed the room, two hand towels were placed in the main bathroom, and none were placed in the smaller bathroom. I could understand this if the second bathroom is not being used, but it was obvious it was used, and each day we had to take a towel from the main bathroom to the smaller one. It is not a big deal, but small details matter. The Wi-Fi is very slow. I'm not sure if this is just in our specific room or the whole hotel, but it was faster to use 4G. Noise carries down the hallways and into the rooms. If you have neighbours that talk loudly in the hallway, it carries into the room easily. There is construction occuring opposite the hotel, though the windows do a decent enough job of blocking it out. The hotel had a special Oktoberfest themed dinner buffet, which was delicious and very well priced. There was so much delicious food on the buffet; it was a struggle to sample everything! The German beer on tap was also a nice touch! We also had a-la-carte dinner one night, and the lamb was fantastic. For room service, we ordered the burger and club sandwich, both of which were delicious. We are looking forward to our next stay! Stay at Grand Mercure Jinan was nice, as expected. But as we are used to a warm climate we were expecting that the room temperature could be adjusted, that was not the case. Otherwise everything in order, Clean room, clean bathroom. Definitely recommend for staying. The facilityies of the hotel are new and nice. The breakfast is good. ANd the staffs are polite, waiting for helping the guest all the time. We had a very comfortable stay. On check-in, we were given a room upgrade to a junior suite, based on our gold-level membership, though we did have to ask for our welcome drink vouchers. The construction on a higher floor affected our stay, so we asked if we could move to a different room, which was granted - and we received a further upgrade to an executive suite, which was most appreciated and unexpected! The rooms are well appointed, but are starting to show their age. For example, the carpets have stains, the junior suite's headboard was peeling and the paint in the shower was peeling. Both suites showers had a very weird and unpleasant drain smell following showering. However, the beds are extremely comfortable, with a choice of comfortable feather and foam pillows. Dinner in the Oasis restaurant was good, without being exceptional. The tenderloin steak was cooked very well, though the mushroom sauce was quite &quot;watery&quot;, and while the curry was very delicious, the chicken was dry. When we enquired about the cocktail menu, the manager had to go to the bar to find out the ingredients in the drinks - perhaps it would be beneficial for the cocktail list to list the ingredients for each cocktail/mocktail, so the guest can know the ingredients without needing to ask the staff? The Singapore Sling cocktail I ordered was the strangest Singapore Sling I've ever had and tasted like a gin and soda (I'm not convinced it had cherry brandy, triple sec or Dom Benedictine in it, and usually this cocktail uses pineapple juice). I understand that each hotel will make a cocktail differently to other hotels, however if the cocktail list stated that it only contained gin, soda and a cherry garnish, I likely would not have ordered it. We ordered room service once. The burger was fantastic, as was the club sandwich (though the bread was a little soggy by the time it arrived). The chips were delicious and perfectly seasoned. The room service was very reasonably priced. When we enquired about getting a 3pm late checkout, we were advised that we could have a complimentary 2pm late checkout, but a 3pm late checkout would incur a 50% daily fee. When we informed the desk that we were gold-level members, and late checkout (if available) should be complimentary, the staff confirmed the policy of an extra charge at 3pm, so we left at 2pm. Every staff member we interacted with were friendly and professional, and we would definitely return to the hotel. Have to wait to be checked in. Priority lane check-in was occupied with a big group of guests which I doubt should be using the lane. Check-in staff was not professional and attended to a queue-jumper instead of the guest queuing behind me just because he made a fuss, causing the guest behind me becoming angry and a situation occurred. Was also not offered welcome drinks voucher.